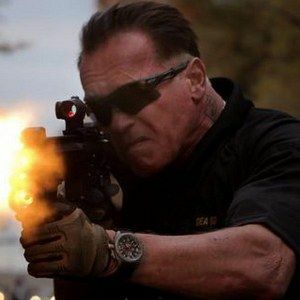 Action icon Arnold Schwarzenegger returns to the silver screen next April with director David Ayer's Sabotage. USA Today has debuted five new photos from the action-thriller, which follows a group of DEA agents who are taken out one by one after a drug cartel raid. Check out the photos, featuring commentary by Arnold Schwarzenegger, which give us our first look at Joe Manganiello and Mireille Enos. An exclusive sneak peek of Sabotage. Arnold Schwarzenegger stars as DEA agent John "Breacher" Wharton in the thriller out April 2014. Under the direction of David Ayer, even the iconic action star had to have a month of training to act, shoot and think like a DEA agent. In this scene, Wharton tries to stop a fleeing enemy, according to Arnold Schwarzenegger. "Here, the only way to stop them is to use a high-powered automatic machine gun and to try to whack them." Schwarzenegger says the constant training helped his screen DEA unit (including Joe Manganiello as "Grinder", left, and Mireille Enos as Lizzy) to work, and bond, like their true counterparts. "We all got very close working that much together." The intense training allowed for tightly choreographed maneuvers onscreen to be performed without constant reshoots. Here's what Arnold Schwarzenegger had to say about the precision needed for this shoot. "There was no, 'Let's do it again because you carried the weapon the wrong way.' There was none of that. There were no mistakes." Schwarzenegger took his worst haircut ever and a neck tattoo to effectively portray his war veteran character. David Ayer told the star that he didn't want him to look good for the movie, but "real." "I got used to the haircut. It's like someone put a pot on my head and just cut around it." Schwarzenegger (with a cornrowed Joe Manganiello as 'Grinder') says he was proud of the ensemble cast, which includes Terrence Howard, Olivia Williams and Mireille Enos. "This is a very intense movie. I don't know if everyone has the stomach to handle this. It's brutal. We're taking the action thriller to new heights."